This is the true story of Astra Sabondjian, born into culture and privilege in late nineteenth century ancient Armenia, which is no more. From her earliest days, savage wars force a nomadic destiny through five countries, for more than forty years. Set against a historical and political backdrop, the story analyses the psychological perspectives of a reluctant heroine where life imposes this. Refusing to be a victim, and driven by a mission to build a safe haven around the people she loves, she meets spine-chilling fate head on. Astra, idealistic, radical and passionate, marries her hero, a well-known newspaper editor and political activist, but living in an empire seething with brutality and ethnic intolerances, mortal dangers are never far away. Forced to abandon personal dreams, she reaches deep into her creative talents, which take her to unexpected heights, but then…..in her life she must learn to always expect the unexpected. 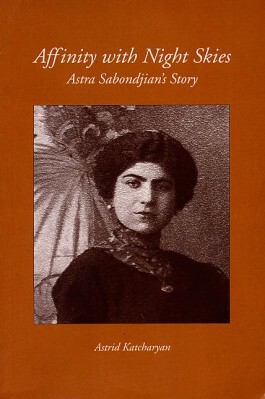 Astrid Katcharyan was born in London of Armenian parents. Armenian is her first language. She spent her early years in Venice, where her family still live. She graduated from London University and currently works as a Careers Adviser, specialising in Media Careers at the University of the Arts, London. She has published a book on careers in the fashion industry as well as other work related materials, but this is her first narrative work. She lives with her son and partner in North London.